It was the first piloted flight in history. Before this flight was the experimentation that led up to it. First the Wright’s studied flight. They studied how birds achieved loft by air flowing over the curvature of their wings and they mimicked that by wing warping. Wing warping is arching the tips of wings to control the rolling motion and balance of the aircraft. For three years the pair designed gliders. The gliders were both manned and unmanned kites. They studied the competing flight studies of Cayley, Langley, Lilienthal and Chanute. Each flight enthusiast knew the key was in controlling the flying aircraft. In order to get the best results, the Wrights selected Kitty Hawk, North Carolina because of its wind, sand, and hilly terrain as the testing site for their full-sized glider. The Wrights built a fifty pound biplane glider in 1900. It had a 17-foot wingspan and a wing-warping mechanism. It was the first piloted glider, but it was also flown unmanned. The controls and landing gear need refinement. Which the Wrights planned to do in a bigger glider. The Wrights moved their experiments to Kill Devil Hills, North Carolina. They built and flew their largest glider with a 22-foor wingspan, weighing over 100 pounds. The glider had many problems. The forward elevator could not control the pitch, the wings did not have enough lifting power and the wing-warping mechanism often cause the glider to spin out of control. This caused the Wrights to review their calculations. They concluded that their numbers were unreliable. They needed to run tests on more wing shapes to test lift. From these test they designed a glider with a 32-foot wing span and a tail to stabilize it. In 1902 the brothers flew test glides and discovered a movable tail would assist with balance and wing-warping would help coordinate turns. They also studied propellers and designed a motor and a new aircraft strong enough to carry the motor. The aircraft also had to withstand the vibrations from the motor. The aircraft was called the Flyer and weighed 700 pounds. After building a movable downhill track to launch the Flyer that first 12 second flight was achieved in 1903. On November 9, 1904, Wilbur Wright succeeded in sustained flying for a full 5 minutes. 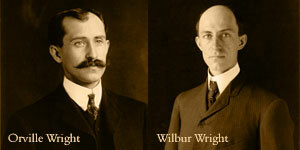 The Wright Brothers were the first to achieve flight of an aircraft in the world. Even though they had temporarily lost hope after back to back failures for years. One more try led to their success and they were the first to fly because they kept trying.